Kitsap Sun photographer Meegan M. Reid was in our newsroom early Friday morning when she heard a harrowing call come over the police scanner. “Something about babies not going to make it,” was about all she could make out, she told me. 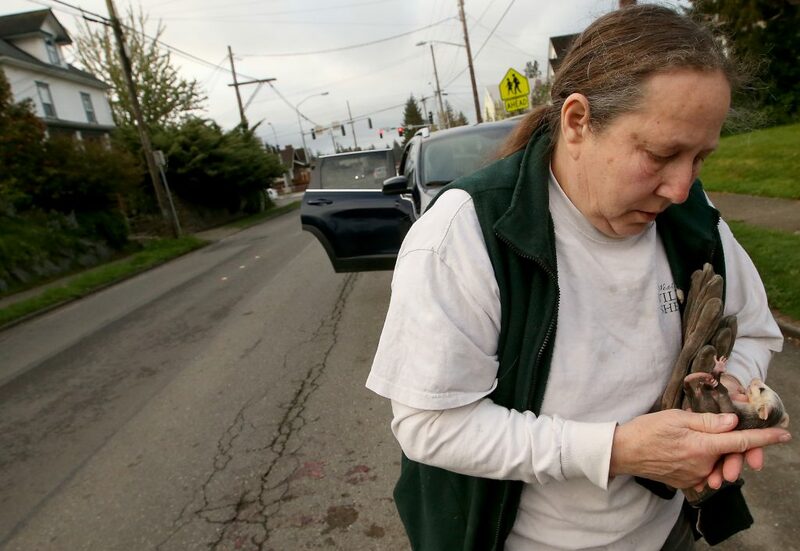 She rushed to the scene, on Naval Avenue, and found police and a woman named Lynne Weber, a wildlife rehabilitation specialist for the West Sound Wildlife Shelter — along with a whole bunch of baby opossums. Sadly, their mother was struck by a vehicle while she was carrying them in her pouch, Reid said. The mother was badly injured but the babies were flung from her pouch, and many appeared to be OK. All were taken to the Bainbridge Island wildlife shelter for treatment. Update: The mother did not survive the crash but the babies did, Weber noted on Facebook Sunday. Lynne Weber here. Having read some of the comments posted, thought it time to respond. 1. 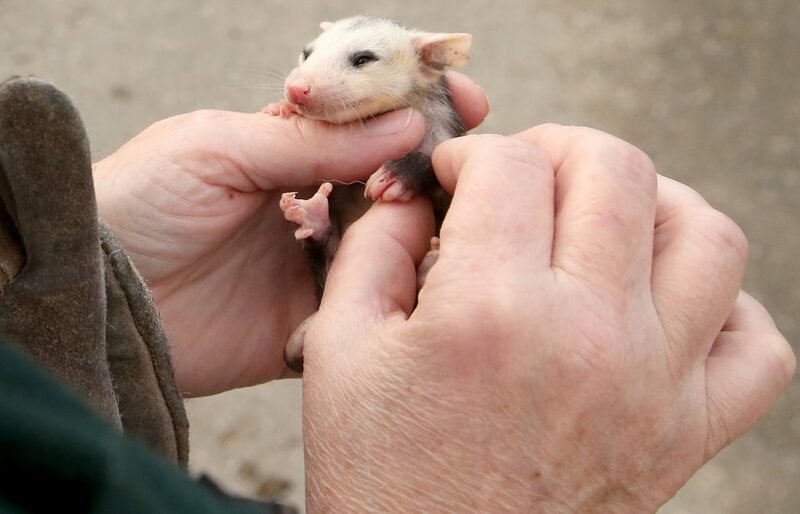 Correct opossums are not native, but they have not displaced the skunks. Mostly man is responsible for that in Kitsap, although there are still skunks in Pierce and other counties in the state. 2. West Sound has all the necessary permits to care for and release wildlife, as do I personally. I am a state and federally licensed wildlife rehabilatator. 3. To all the folks who have cared enough to bring wildlife to us,THANK YOU! PLEASE know we do everything possible to return these animals to the wild. But sometimes it just isn’t possible, weather from wounds, or internal injuries or just maybe you found a single little baby who had been abandoned for a reason by the parent. They can only afford to raise the healthy. It is also my job to humanly ease their suffering if that is needed as well, but it is not something we do lightly! Opossums technically are marsupials, not rodents. And last, but not least, the mother was humanly euthanized only after we ascertained she had a crushed jaw, cheekbone and a damaged eye. All 12 of her babies are doing fine, although the one you see in the picture does have a small laceration on her leg which sustained when mom was hit. It is being treated.So far all are doing well. I am grateful for your responses … many thanks!